The Mardi Gras season is definitely upon us now. We are getting our Krewe Den this weekend. All Nereids are to try on last year’s costume, put it on a hanger with your name pinned to it, attach a note saying if it needs to be taken in, let out, any rips or repairs needed, etc., and have your costume at Krewe Den in the Costume Department before next Wednesday. The Nauga Brunch is tomorrow beginning at 10 a.m. All of those attending please wear your animal print pajamas and join those Naugas for THE party of the year on the beach. Last Friday was the Mystic Krewe of Nereids Moon pie Party. That was the best moon pie party that we’ve had since I became entangled with these crazy Nereids. The crowd was huge. The music was loud. The moon pies were all over the place. I know I danced so much that I worried that I wouldn’t be able to move the next day. Since this is our year of the Dancing Queen, she had us all on stage doing last year’s dance routine. It was pure and simple fun, fun, and more fun. I’m still fascinated with Pinterest. One Pinterest item that I read a week or so ago said that rather than using a dryer sheet to get out the static cling from your clothes, lightly wad up a piece of aluminum foil and throw that in the dryer. We did it and it works. The aluminum foil comes out wadded tightly but there is no static cling AND you can use the foil over and over again. This reminded me of my daddy. I remember when I was a little girl living in Lafayette, one day my hair was standing on end with static cling. My daddy told me to go hold onto the metal plumbing pipe. I did and voila the static cling was gone. I think the aluminum foil in the dryer must be along the same principle as holding onto the metal plumbing pipe. George and I have had a couple of really nice, big, carrot salads lately. Just mix shredded carrots, raisins, and a bit of mayonnaise. 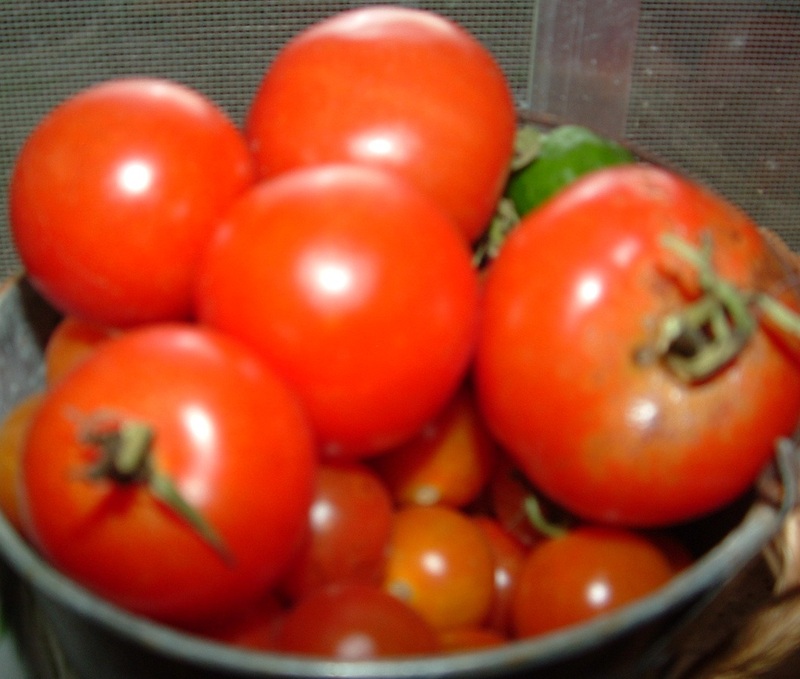 There simply is nothing like fresh vegetables right out of the garden. Right now we are harvesting carrots and have planted more. About now, Mama would be commenting on carrots being so good for your eyes. When I was little she would tell me to eat my carrots so I could see well. I’d eat them and she’d says, “What can you see now that you’ve eaten your carrots? You should be able to see really good now.” It is a shame that we’ve never been able to grow beets here. Mama loved beets, as I do. She would tell me to eat my beets so that I would get smart. We have some broccoli plants that have not begun to produce yet. This year we remembered to plant celery in January. I sure hope it grows. Oh yes, the sweet peas are growing, too. If that’s not enough, the camellias and snapdragons are blooming. There is a bit of sad news this week. Our little white, spaniel mix dog was put down on Monday. Stinky was 17 years old. George got Stinky when he worked for the zoo. The wife of the owner of the zoo couldn’t keep Stinky anymore and asked George if he would like to have her. I don’t think she ever weighed more than 25 pounds and this last year she was less than 20 pounds. I remember the day George brought her home. She was sitting in the passenger seat of his black truck and the contrast between the little white dog and the black truck made her look so pretty. She was a beautiful dog. We had pizza for dinner that night and our other dogs were trained not to touch our food. I didn’t think anything about leaving my pizza on a plate in the living room while I went to get a drink. The next thing I knew this little white dog had my pizza in her mouth and was running across the living room floor. At Christmas she would lay down on the sofa next to me and as I would open presents, I would put the sticky bows on her head. She was adorable. One year we dressed her up as a MerMutt and took her to the beach for the Critter Crawl. We could tell that age was getting to her this past year. She began having tumors; her teeth were bad; she had cataracts; she had a bad back that atrophied, just a lot of old age problems. Monday morning she couldn’t walk. We took her to the vet and it was time. Normally, George would send me to pay the bill while they euthanized, but, I held her. I held her in my arms as they gave her a sedative and then THE shot. I still held onto her, petting and caressing her sweet little body. The vet listened for her heartbeat and told us she was gone. I continued holding her and stroking her soft, white fur. My little friend for so many years was asleep and peaceful. Tears were streaming down our faces. We said our goodbyes. There was a beauty about this. It is hard to explain. I know that she is in heaven running in a large field. She could run like the wind in her younger days. I do miss our little Stinky but I’m so grateful that she is no longer suffering. She is in a better place and I will see her again someday. All of my work in our Etsy Store is beginning to pay off. Last month and this month have been our absolute best months ever with the Etsy Store. We still need to increase sales more, but these 2 months have been very encouraging. This week I received a call from a young lady who had made a purchase from us on Etsy. She has not received her purchase yet and she made the purchase on January 5th. This is the first time we’ve had any problem with our Etsy customers. As it turned out, she gave us the wrong address. Apparently she moved from her last apartment to her new apartment during this time period. I told her to please see if the package arrived at the old address and if she did not receive it or had any problems, I would make her another. I want happy customers. Her demeanor totally changed and she said, “Really?” Yep, I want happy customers, period. This year the Mardi Gras season is pretty short. Our parade on the beach is on February 19th. One of the krewes from Pensacola contacted me wanting patches. Several ladies in this krewe are friends of mine from my legal career days. The krewe will be meeting at the end of January and deciding how many patches they want. Right now I have an order for one. One is a beginning. The krewe I the Krewe of Sirens and the patch is a mermaid. As I told a friend recently, I am up to my ears in mermaids and I love it. I have several other projects on my plate right now. If they all come through we are going to have a very busy Mardi Gras season, indeed. The krewes that have contacted me have all said the same thing that the Nereids are saying right now: “Oh my gosh, Mardi Gras is here and we aren’t ready!” Last minute orders are becoming the routine. NOT, IT’S AN INTERESTING TALE! sounds like an Alfred Hitchcock tale, it's real. go off the road and into the bayou and he would then drown! through the window and Saul was alone again. pushin' it in DA rain!!!" I do apologize about missing last week’s issue of Cajun Corner. There was simply too much on my plate to get it out. As they say, “Absence makes the heart grow fonder,” so, I’m hoping all subscribers are really eager to read this issue. Jane Waters Cooper arrived on Pensacola Beach from her home in New Orleans in 1978. Among many things, she was a journalist. She owned the local beach newspaper and had her hand on the pulse of the island. Jane was one of the founders, if not THE founder, of Mardi Gras on the beach. She was instrumental in creating many community enhancements, as well as some frivolities. The most significant to me is the SOBs, Sisters of the Beach. Miss Jane, as she was known on the island, passed away recently. She was 90 years old. I don’t recall ever being formally introduced to her and I’ve only seen her a few times. Each year after our SOB brunch, several of the SOBs, including myself in recent years, would go to Jane’s home and serenade her with a Christmas carol. When I first began playing with the Nereids, my friend and sponsor, Paulette, made me read two books: (1) The Sweet Potato Queen book; and, (2) to the Beat of an Island Drum by Jane Waters Cooper. Jane’s book is a history of Mardi Gras on the island. Anyone interested in getting to know the islanders really should read this book. Initially the book didn’t mean a lot to me. I knew a few of the names. As time went by, I realized that I was meeting more and more of these wonderful, wacky people, and Jane’s book became more and more important in understanding this place called Pensacola Beach. Jane has four daughters. One I’ve never met. One I recently met. One I’ve met a few times. And, one, Shelley, is a close friend of mine and owns the local beach newspaper, Island Times. (Everyone needs a subscription to this newspaper. It is the only newspaper where Cajun Stitchery advertises.) Over these past couple of weeks since Miss Jane’s passing, I had the privilege of getting to know and bond with Liz, who I had only briefly met once or twice previously. Lastly, but definitely not leastly, is Candy. I’ve heard about Candy but never had the privilege of meeting her until Miss Jane’s Memorial Service earlier this week. As it turns out, Candy is one of my neighbors here in Warrington. Small world, isn’t it? Candy is an engineer. That may not be significant to this story, but people who know me know that means I will not have the least bit of trouble bonding with Candy. Many people have told me that I should have been an engineer like my father, and uncle and all of my engineering relatives. In fact, Candy and I are already developing the SOWs, Sisters of Warrington. But, I digress. I said this was a sad and happy occasion. The happy occasion is that within a few hours of Miss Jane’s passing, her great grandson was born. Is that the circle of life, or a miracle? What it appeared to me to be was just plain perfect timing. The sadness of losing Miss Jane was counteracted by the happiness of gaining her great grandson. In addition to Miss Jane, I’ve been knee deep in Nereid frivolities. Last weekend was our annual bead trip to Mobile. We left Friday morning. Yep, the girls came into my house and poured my luggage, me and my cup of coffee into the car and off we went to Mobile. I am my mother’s daughter; therefore, I am not a morning person. The rule is: what happens in Mobile, stays in Mobile. Suffice it to say that we had a wonderful time and I do believe this was the best bead trip ever. We returned on Sunday and attended Miss Jane’s memorial service on Monday. You do recall that I own a business, Cajun Stitchery? I recalled that Tuesday morning when I realized that I have a lot of work to do. Playing around stopped and I began working in earnest. Okay, I did play with the Nereids Wednesday night but that was after hours. Baby blankets take time but are a favorite thing for me to make. However, the custom baby blanket order that I received was nothing like the baby blankets I usually make. This one had the cross hairs from a rifle scope for the opening in the letter A of the baby’s name. The blanket order requested fleece as the fabric. The design was really cute for a boy. In the end, the fleece was a camouflage print with peace signs in a khaki green. What I loved the most was under the design for the name was: “Sniper in a Diaper.” How cute is that? I have to use that one again. 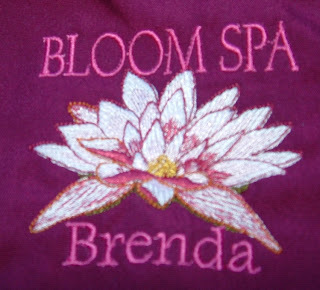 With fleece all of the literature says that you use wash away stabilizer to hold down the pile of the fabric so the embroidery stitching doesn’t sink into the pile and vanish. I really don’t like wash away because I never seem to get it all washed away. I have found that putting some mylar underneath does just as good and adds a bling. The mylar would not have worked on this blanket for two reasons. One, I would never use mylar for a baby blanket. Two, a little boy with a camo blanket does not need bling. I ended up using plain tear away stabilizer and it worked just fine. Since I did the digitizing, I ended up with something like seven stitchouts. I was having a dickens of a time with the registration. The fleece really didn’t need it, but to get a nice straight edge, I serged the edges. After I was finished and folded the blanket many different ways, I thought it would look cute folded like a sleeping bag. Once I did that and I was looking at all of the stitchouts, I decided to make a bag from the stitchouts for the blanket. It did turn out very cute and I was able to use my new grommet press that I got for Christmas. Another order this week that was a lot of fun was from our cute little ToucanSave lady. She wanted a couple of scarves to wear like a headband but with the tails coming down to her chest. This was kind of a 1960’s look. On the headband area, we embroidered the ToucanSave logo with some heavy stabilizer. Then just the area with the logo was sewn closed. One was done on a navy blue, stretch fabric, similar to jersey. The other headband was on a bright yellow/gold, silk fabric. They are adorable. I’m wondering if people who shop on Etsy would buy these headbands? Vintage and the ‘60’s look are really popular now. 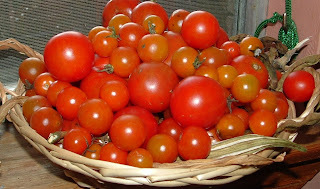 More orders came in for the market baskets, so, I had to place another order for baskets. They arrived last night. It appears that the rhinestones and mylar are popular with members of our local krewes. The next one is going to be for a Queen. George and I have been working in the garden. We harvested a bunch of carrots and George made a delicious carrot salad. The broccoli is growing as well as some sweet peas. We planted celery and bunching onions. Oh, how I love to garden. This year’s design for my Krewe’s birthday gifts was a big success. The first gift was given and there were plenty of ooo’s and aaaaah’s. It is a large mermaid on a white beach towel. The mermaid’s hair is done in Mylar. Since I have such strong feelings on buying local and buying MADE IN THE USA, I did a little research online and found that there are still a few remaining fabric mills. One is in Mississippi and looks like it is about a 2 hour drive from Pensacola. We may have a road trip ahead of us. I emailed the mill but haven’t received a reply yet. Another one is in Texas. No road trip there. Now I need to find out the prices and see if their minimum order is something I can manage. Since all of my thread is MADE IN THE USA, it would be nice to tout that my fabric is also MADE IN THE USA. Right now I don’t know where my fabric is milled. It could be the USA. I just don’t know. My business consultant once told me that my niche will change with the times and I will probably end up surprised where my niche lands. Well, I think that one of my niches is going to be scarves. Since I did the research a few weeks back and found that China and India are #1 and #2 in the manufacturing of fashion scarves, it has just eaten at me. I know how to make scarves and it is not difficult. Given the right price on the right fabric, the right equipment, even I could compete – I think. no matches, he asked Boudreaux for a light. “You haff a Genie?” Prejean asked. “Yes, I will,” says the Genie. a million ducks....flying directly overhead. Ahhh, a new year. First on the agenda is, Happy Birthday, Mama. She would have been 94 today. The Mardi Gras season is upon us. Today at 3 p.m. at Paradise Bar & Grill on Pensacola Beach is our King Kake Party. Everyone is invited and sure to have a great time. There will be music, and, of course, King Kake. Most important, though, is we crown our krewe’s new king and queen. Come on out and party with the Mystic Krewe of Nereids. My George has celebrated his birthday for nearly a week now. Happy Birthday, sweetheart. He is definitely a keeper. Our fall garden is gone. The recent frigid temperatures in the 20’s finished those plants. We had harvested everything we could before the freeze. It was time. Ha! Of course, it was. First week of January every year, like clockwork, there is a freeze. We had a freeze for 2 days and now we are back in the 50-70 degree range. That was just the fall garden. We also have a winter garden. George took out all of the old plants and we are getting ready to transplant some broccoli and plant some celery. Our garlic and carrots are still growing, as is the catnip and parsley. I love gardening in Florida because you really can garden 12 months out of the year. Last year may have been the year for Facebook but this year may turn out to be the year of Pinterest. What is Pinterest, you ask? Go to www.pinterest.com. I’m not really sure what you would call it. It is pictures. It helps you organize. Where some bulletin boards on the internet allow you to “post”; Pinterest allows you to “pin”. It is just their cutesy name for it; or, “posting” may be words where “pinning” is pictures. Who knows? You must be “invited” to Pinterest. If you would like to be “invited”, just let me know and I’ll be glad to send the invitation. This all sounds so dull. Let me tell you that from the first time I went to Pinterest, I was hooked. I simply could not stop looking at the pictures and reading the comments. It looks like it will be a good venue to post Cajun Stitchery items, and that is the real reason that I’m on Pinterest – but, I simply cannot stop looking at the pictures, and reading the articles. Once you are registered on Pinterest, you can have as many “boards” as you like. The boards are used for organizing. For instance, you can have a board for home décor, or recipes, or gardening, or whatever you like. You can have as many boards as you like. As you find things on the internet, or Pinterest, you can put them on the appropriate board for future reference. Let’s say you want to redecorate your living room. A search on the internet brings up several photos of your style, or a chair that would work perfectly, or a painting, or whatever. You would just “pin it” to your board with a tool that you keep in your favorites. As you collect photos, you can go to your board and start to define how you want to decorate your living room. You can also save arts and craft tutorials, a good article, whatever you want. I’m still trying to get used to the organizing of the boards and remembering to click the appropriate board for the items that I’m pinning, but that is just learning. People are visual. Pinterest is in our future. I do not see Pinterest taking the place of Facebook, though. A friend that I met on Facebook ordered two of our flannel scarves. 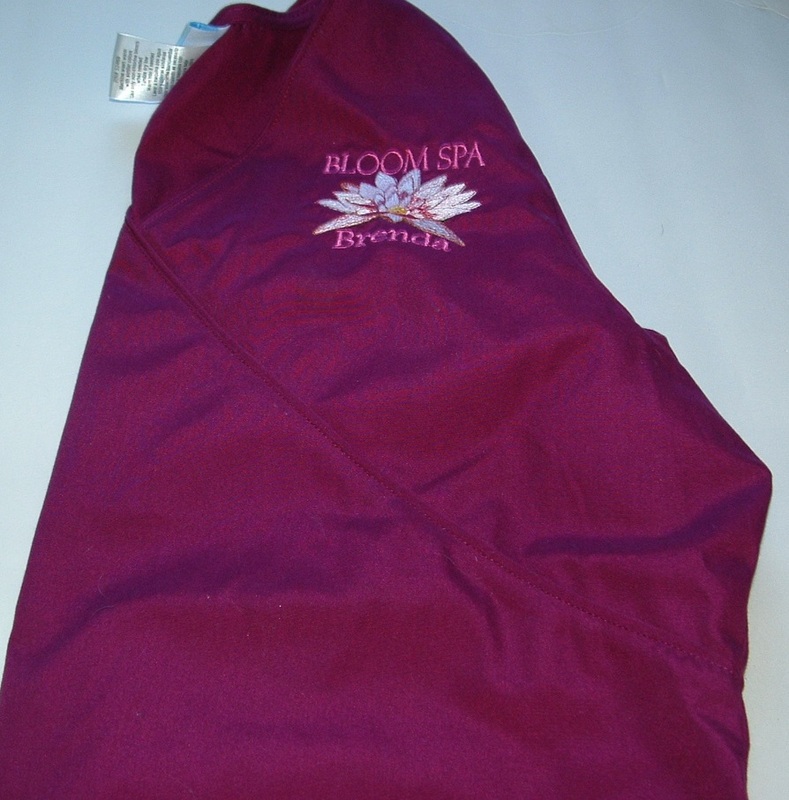 One was the “Party Girl” scarf – embellished with rhinestones, of course. The other was custom. 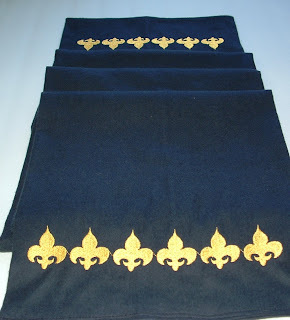 She wanted a man’s long scarf in black flannel with gold fleur de lis. I was a bit worried that I would not be able to find solid black flannel, but there was nothing to worry about. I found the black flannel at the first store. A search on the internet showed me that men’s sporty, long scarves are the same size as women’s. They are about 72” long by 10” to 20” wide. The one I made for her was 72” long by 10” wide. 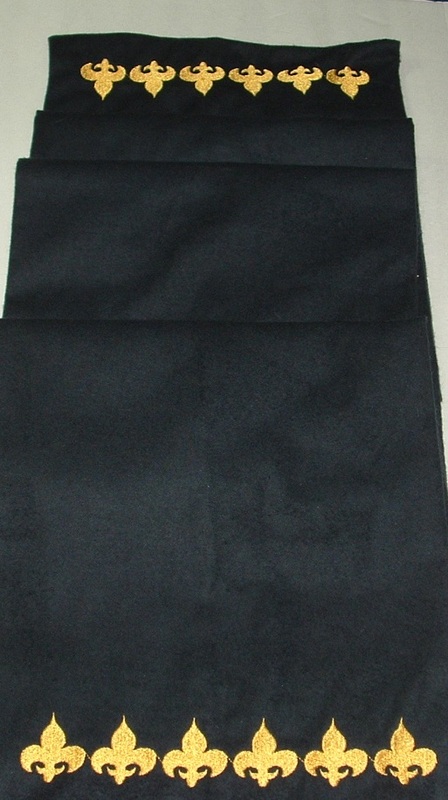 The fabric was doubled to hide the back of the embroidery. In my opinion, it would have been too bulky if it were any wider than 10”. Nevertheless, the scarf turned out so beautiful that I’m making another one to list in our Etsy Store. After all, the Saints ARE going to the Super Bowl again this year, right? Our end of the year Etsy sale was a lot of fun. Several items were sold. Scarves seem to be the thing that people wanted. Not only was the sale fun, but it gave me an opportunity to go through all of the items in our Etsy Store and do some extra embellishments here and there. I was also able to see some things that I want to take out of the store--forever. The market baskets are still selling like hotcakes. The rhinestoned and Mylar Mystic Krewe of Nereids design is a hit. Personally, I think each krewe needs to have their own krewe’s design for market baskets since we all carry so much stuff. The latest market basket order did it up right. The customer ordered the Nereid design on one side of the basket with her name embroidered on the other side. It is perfect. What do you do if you already have a market basket but your basket isn’t purple, green, or gold? That’s easy. You get a market basket for Mardi Gras, patriotic holidays, Halloween, and Christmas. You have a purse to match different colors or seasons, don’t you? You also need a matching or holiday appropriate market basket, too. I finally came up with the 2012 design for my Krewe’s birthday gifts. The design should be revealed today when our first birthday girl of the year receives her gift. After that, I will be able to show off the new design. I digitized it myself and I sure hope those girls like it. Another friend of mine has started a website called www.stronglocalbusiness.com. She has some really good articles on her website and also has forums and several interactive things. It is worth a visit. The whole gist is to buy local and buy made in the USA, thereby creating and saving jobs. I cannot stress enough my feeling that the USA has an abundance of untapped talent. I’m not blind to the fact that we live in a world that gets smaller each day due to technology; that there are people starving in third world countries; and that the majority of US citizens cannot imagine living without conveniences that other people in the world cannot imagine having. However, in order to help others, we need to help ourselves. The caregiver must also take care of herself/himself to be able to continue being a caregiver. We all need to buy local and buy items made in the USA. While making scarves, I did a little research and the number one country in the world that sells fashion scarves is, you guessed it, China. Number two is India. My scarves are handmade right here in the USA. Even our thread comes from a mill in North Carolina. We can do this, but we need to unite and do this together. We can turn around our economy and put ourselves in a healthier position to help others. 1. Preheat oven to 350° F (180°C). Prepare three 6-inch round cake pans with butter, parchment paper rounds, and cocoa powder. Tap out excess. 2. In bowl of electric mixer, sift all dry ingredients and add all remaining ingredients to bowl with the dry ingredients and with paddle attachment on mixer, mix for 2 minutes on medium speed (you may need the plastic splash-guard that comes with mixer) and pour into prepared pans. If possible, use digital kitchen scale and weigh divided batter in pans for even layers. Batter will be liquidy. 3. Bake for 20 minutes and rotate pans in oven. Cakes are done when toothpick or skewer comes clean–approximately 30 minutes. Try not to over bake. 4. Cool on wire racks for 20 minutes, then loosen edges with a small palette knife, and gently invert onto racks until completely cool. The first step is making the salted caramel (you can also do a non-salted caramel by omitting the sea salt), to set aside to cool while you make the Swiss Buttercream. You then add the cooled caramel sauce it to the buttercream as the very last step. I haven’t tried buying ready-made gourmet caramel sauce and adding it, but I suspect it would taste nothing short of awesome. 1. Place 130 grams (5 ounces or 1/2 cup + 2 tablespoons) of the sugar and the water in a medium saucepan to a boil over medium heat. Brush down the sides of the pot with a dampened pastry brush to prevent sugar crystals from forming. Stop stirring and cook until caramel is dark amber, gently swirling from time to time. Remove from heat, and slowly add cream, whisking by hand until smooth. It will be splatter, so be careful. Whisk in sea salt. Let cool. 2. Place butter in an electric mixer fitted with the paddle attachment (flat beater) and beat on medium speed (I use #4 on my mixer), until pale and fluffy, about 3-5 minutes. Transfer to a large bowl and set aside. 3. Wipe the bowl of an electric mixer clean with lemon juice, and place egg whites and remaining sugar into bowl over a pot of simmering (not boiling–you don’t want to cook the eggs). Whisk occasionally and gently until sugar dissolves and mixture registers 160° on a candy thermometer. 4. Remove the bowl from heat, and place back onto the mixer fitted with the whisk attachment. Whisk on medium speed for 5 minutes. Increase speed to medium-high, and whisk until stiff, glossy peaks form (about 5-6 minutes). Once the bottom of the bowl is neutral and no longer warm to the touch, reduce speed to medium-low, and add beaten butter, one cup at a time, whisking well after each addition. 5. Switch to paddle attachment. With mixer on low speed, add cooled caramel, and beat until smooth (about 3-5 minutes). 6. Prepare to taste the most incredible buttercream you will ever encounter. 1. Combine cocoa powder and the boiling water in a small bowl or glass measuring cup, and stir until it cocoa has dissolved. 2. In an electric mixer fitted with the paddle attachment (flat beater), beat the butter, the icing sugar, and salt on medium-high speed until it is pale and fluffy–about 5 minutes. 3. Reduce mixer speed to low, and add melted chocolate (cooled), beating until combined and scraping down the sides of the bowl as needed. 4. Beat in the cocoa mixture until well incorporated. 1. Frosting can be refrigerated for up to 5 days, or frozen for up to 1 month in an airtight container. 2. Before using, bring to room temperature (usually overnight on counter does the trick), and beat on low speed until smooth.